Wheat (Triticum aestivum L.) is one of the top three food crops in the world. Studies have revealed that wheat endosperm development undergoes programmed cell death (PCD) process development that may be influenced by PCD. Waterlogging and exogenous hydrogen peroxide (H2O2) treatment exacerbates wheat endosperm PCD, whereas PCD acceleration is significantly inhibited by reactive oxygen species (ROS) scavengers. 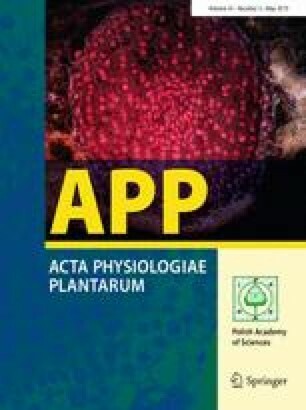 To explore the physiological mechanism of waterlogging resistance in wheat, the effects of exogenous H2O2, ascorbic acid (AsA), and cyclosporin A (CsA) treatment on ROS content, antioxidant enzyme activity, release of cytochrome c, and caspase-like protease activity in the endosperm of Huamai 8 (waterlogging-tolerant wheat cultivar) and Huamai 9 (waterlogging-sensitive wheat cultivar) were studied. The results showed that exogenous H2O2 treatment resulted in an increase in ROS content, antioxidant enzyme activity, mitochondrial membrane permeability, release of cytochrome c, and caspase-like protease activity in the endosperms of both wheat cultivars, which eventually exacerbated PCD. Compared to Huamai 8, the increase in ROS content in Huamai 9 was more significant, whereas changes in antioxidant enzyme activity, cytochrome c release, mitochondrial membrane permeability, and caspase-like protease activity were smaller. Exogenous AsA treatment leads to the content of H2O2 and catalase activity decrease, which could inhibit endosperm cell death to some extent. CsA treatment effectively inhibited the increase in H2O2 content, antioxidant enzyme activity, release of cytochrome c, and caspase-like protease activity caused by exogenous H2O2 treatment, which in turn inhibited cell death. In summary, exogenous H2O2 treatment aggravates endosperm PCD, and Huamai 9 exhibited higher ROS accumulation and a weaker antioxidant enzyme system under external stress, which may be the mechanisms underlying its sensitivity to waterlogging. CsA effectively inhibited the increase in ROS, antioxidant enzyme activity, cytochrome c release, and cell death. It is possible that in wheat endosperm, mitochondria in a similar way to animal mitochondria release cytochrome c regulating PCD. Ze Lin and Yuanhong Qi contributed equally to this work. This work was supported by the National Natural Foundation of China (Grant nos. 31471428).